Egypt’s vice-president Mahmoud Mekki has announced his resignation on the day the country completed its voting in a controversial referendum on a draft constitution. Polls have now closed in the second leg of the referendum, which is widely expected to approve the draft. However, opponents say this will not end the country’s unrest. They say the constitution favors Islamists and betrays the revolution that overthrew Hosni Mubarak last year. President Mohamed Morsi and his supporters say the document will secure democracy. Late on Saturday, state television announced that the central bank governor, Farouq al-Uqdah, had also resigned from his post. However, a cabinet official later denied the report. Mahmoud Mekki announced his resignation just hours before the end of voting in the second round of the referendum. 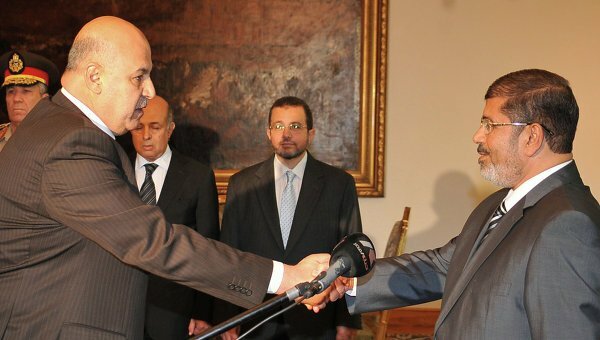 Mahmoud Mekki, 58, said he had tried to resign on 7 November but that circumstances had forced him to remain. The Israeli conflict in Gaza and President Mohamed Morsi’s controversial decree on November 22 granting himself sweeping new powers delayed his decision. Mahmoud Mekki’s resignation statement indicated he had no prior knowledge of the decree, which stripped the judiciary of powers to question the president’s decisions. He appeared to be giving the impression that he was unhappy with not being consulted on key decisions. If, as expected, the draft constitution is passed, there may have been no role for Mahmoud Mekki as the document does not require the president to appoint a vice-president. Seven of Mohamed Morsi’s leading advisers have resigned over the past month, many indicating they had not been consulted over the president’s moves. Egypt has seen mass demonstrations on both sides ever since. However, voting in the second stage of the referendum appears to have gone relatively smoothly. Some 250,000 security personnel were deployed nationwide to keep order. Polling stations had been scheduled to close at 19:00 but remained open until 23:00. Voting was also extended in the first leg. Ballots were cast in the 17 provinces that did not vote in the first round on 15 December. Unofficial results are expected to come in over the next few hours. Turnout was reported to be just above 30% in the first round, with unofficial counts suggesting some 56% of those who cast ballots voted in favor of the draft. Analysts suggest the document will be passed. Egyptians casting votes in favor of the charter said they were voting for stability. Opponents of the draft say it fails to protect the freedoms and human rights they sought in the uprising that toppled Hosni Mubarak. Some have also complained about the role given to Islamic clerics and what they say is a lack of a clear commitment to equality between men and women. “I’m voting <<no>> because Egypt can’t be ruled by one faction,” Karim Nahas, a 35-year-old stock market broker voting early on Saturday in Giza, told Reuters news agency. Opposition activists say there will be more unrest whatever the outcome. One voter in Ikhsas village, Marianna Abdel-Messieh, agreed. “Whether this constitution passes or not, there will be trouble,” she told AP.